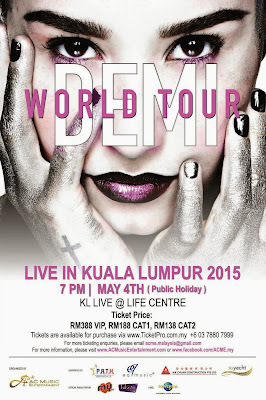 AC Music Entertainment proudly presents “DEMI LOVATO: DEMI WORLD TOUR LIVE IN KUALA LUMPUR 2015” on 4th May 2015, 7 PM at KL Live. Since her first appearance in Malaysia in 2013, Demi Lovato, a multi-talented, and platinum-selling record artiste, is finally returning to Malaysia with her fourth headlining concert tour, “DEMI LOVATO: DEMI WORLD TOUR LIVE IN KUALA LUMPUR 2015”. Malaysia will be the second stop in Asia for Demi’s world tour after Singapore.